Boniface is one of six children. He and his two brothers, Dickson and Eric, all live at the Global Hope Rescue and Rehabilitation Center. Their father passed away when they were all very young, leaving their mother to raise them alone. Jobless, she was unable to provide for them, which inevitably led to all of her children, including Boniface, to the streets of Kibera, Kenya's largest slum. Begging for food, stealing, and sniffing glue, they struggled to survive in Kibera and eventually returned to Ngong to their mother. A short time after coming to Ngong, his older brother Dickson was rescued by Joseph, the Director of Global Hope; Boniface was brought to the center soon after. 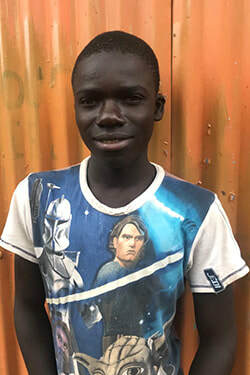 Not long after coming to the center, Boniface and his brothers got word that their oldest brother was killed by mob justice after he was caught stealing. This news was devastating to Boniface and his brothers, but it reinforced their decision to stay out of the streets and return to school. Since joining Global three years ago, Boniface has remained in public school but the center struggles to pay the small amount of money for his school fees.